Heat oven to 375°F. Spray 13x9-inch (3-quart) glass baking dish with cooking spray. Place frozen rolls on cutting board; let stand about 5 minutes to thaw. Meanwhile, in large bowl, beat eggs, milk, salt, thyme, pepper and nutmeg with wire whisk until well blended. Cut rolls into 3/4-inch cubes; place in bowl with egg mixture. 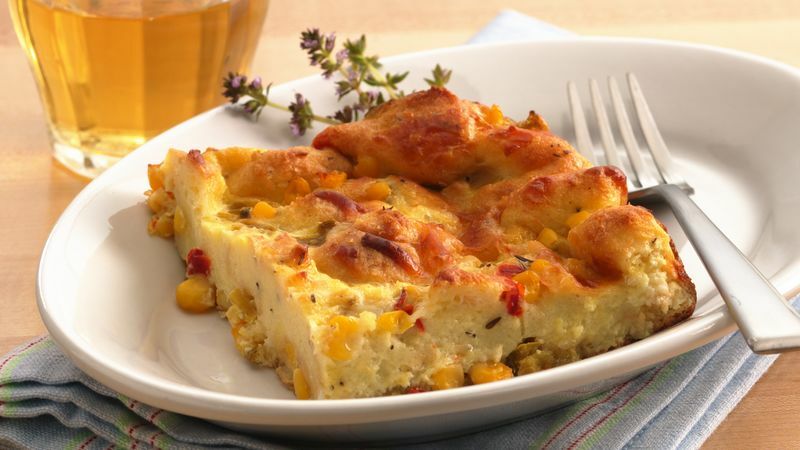 Stir in cheese, corn and chiles. Pour into sprayed dish. Bake at 375°F. for 30 to 40 minutes or until puffed, golden brown and knife inserted in center comes out clean. Let stand 10 minutes before serving. Cut into squares.